For Gloria Mwiseneza and other Rwandan scholars, the summer of 2017 was filled with new opportunities and hands-on learning about agronomy and horticulture. “I learned techniques I hope to apply in Rwanda to develop the agriculture industry there,” Mwiseneza said. Mwiseneza is one of 105 Rwandan students who, as of August 2017, have received a scholarship and are currently participating in the University of Nebraska–Lincoln College of Agricultural Sciences and Natural Resources (CASNR) Undergraduate Scholarship Program. These students are pursuing a Bachelor of Science in Integrated Science that is focused on conservation agriculture, entrepreneurship, leadership and innovative thinking and is aligned with areas of need identified by the Rwandan Ministry of Agriculture and Animal Resources. During their first and second summers, scholars are paired with faculty and agricultural organizations to gain practical, hands-on experience in the lab, with production, in research, in data collection and with fieldwork. Faculty from the Department of Agronomy and Horticulture worked with many of the scholar interns. Professor Richard Ferguson mentored Mwiseneza and Jean Claude Mbarushimana. They assisted agronomy doctoral student Leonardo Bastos at the South Central Agricultural Laboratory near Clay Center, Nebraska, with field work related to assessing ammonia volatilization losses from nitrogen fertilizer in the field and using passive and active crop canopy sensors. “This experiential learning contributed to the choice of courses I’m now taking as well as to my career goals,” Mwiseneza said. 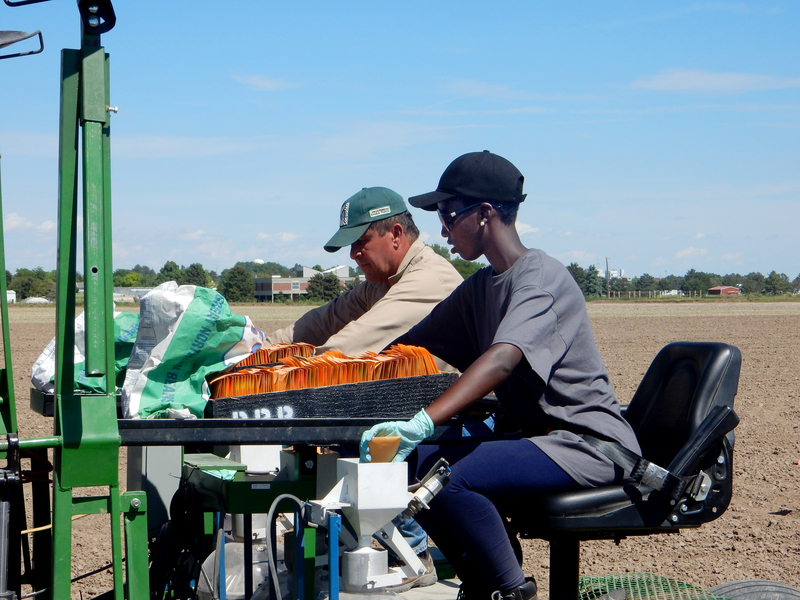 Assistant Professor Bijesh Maharjan mentored Tonny Ruhinda and Joviale Uwase at the Panhandle Research and Extension Center in Scottsbluff, Nebraska, where Maharjan is an extension soil and nutrient management specialist. The scholar interns helped with two research projects: using high-carbon char as a soil amendment and measuring environmental nutrient losses from fertilized soils. Maharjan said the interns were instrumental in collecting soil and gas samples. “Tonny and Joviale caught on quickly to our research, and they were a good fit with the rest of my team,” he said. Ruhinda and Uwase presented their summer experience at a poster competition sponsored by IANR Global Engagement, CASNR and Robert B. Daugherty Water for Food Global Institute at the University of Nebraska. Their poster, which linked their work to their learning and goals for Rwanda, earned second place and a trip to the 2017 Borlaug Dialogue International Symposium Oct. 18–20 in Des Moines, Iowa. Other faculty mentoring at the PREC included Associate Professors Carlos Urrea and Dipak Santra and Assistant Professor Nevin Lawrence. Intern Peace Munyahna assisted Urrea with dry bean breeding activities. In the field, she learned how to lay out an experiment, prepare and plant beans and take data. She also helped install watermarks for drought/heat experiments. In the greenhouse, Munyahna learned how to make bean common mosaic inoculations and took readings (scores), as well as learned how to make hybridizations. Santra mentored Liliane Umuhoza, who assisted with planting nine commercial varieties of peas as a randomized replicated trial. Plants were collected from each plot, and she helped collect data for plant height, first pod height, number of fertile nodes, number of pods per plant, number of seeds per plant, and seed weight per plant. Professor Stephen Baenziger mentored Precious Nyabami and Maurice Tuyishime. Working alongside Baenziger’s small-grains breeding program team, they learned how to take plant height and flowering notes, how to harvest in the greenhouse and in the field, and how to process seeds. “These are very professional, outstanding students who work hard, and they have the same concerns and goals as the American undergraduate students,” Baenziger said. Professor Martha Mamo and Sam Wortman, assistant professor, mentored Ange Agasaro, who studied the effect of a mycorrhizal fungi soil inoculant on tomato growth and yield. “I found that plants are sensitive, almost like humans, and they need a lot of attention to grow better and produce,” Agasaro said. Mamo also mentored Elisabeth Kamikazi, who assisted with researching how livestock grazing strategies influenced nutrient recycling at the Barta Brothers Ranch in the Nebraska Sandhills. Kamikazi said working with a team was new for her. “After this experience I feel working together with others has become easier, and I want to be someone who helps others, no matter the circumstances,” she said. Interns at the West Central Research and Extension Center in North Platte attended several extension programs, field days and tours. Professor Jerry Volesky, former Assistant Professor Rodrigo Werle and Associate Professor Greg Kruger all mentored interns. Christian Dukunde and Jefferson Habanineza assisted Volesky with data collection for various annual forage trials, grazing studies and lab work, and they worked at the Barta Brothers Ranch and the Gudmundsen Sandhills Lab. Prossy Umotoni and Jean d’Amour Ndatira worked with Werle and the WCREC Cropping Systems program with several research projects. One of the projects involved investigating the impact of cover crop species selection, planting and termination time on subsequent crop yield under irrigation and rainfed conditions. Umotoni and Ndatira presented some of the research findings from the program to local producers during a field day. Bonheur Ndayishimiye assisted Kruger and worked on understanding the interactions that exist between different herbicides. In their third summer, students go back to Rwanda to further develop their acquired skill set and knowledge within a local context through projects and internship opportunities. Professor Roch Gaussoin guides the juniors, preparing them for experiential learning back in Rwanda between their junior and senior year. Scholars learn to develop a resume. Rwandan internship providers and other organizations remote-in to class to interact with the students. Later, they are connected with a diverse group of Rwandan agriculture-related companies and government agricultural agencies in areas such as food science, food safety, natural resource conservation, traditional agronomy and engineering. “We’re using all the resources here at the university that are available for any student at Nebraska,” Gaussoin said. “It’s really fun.” For instance, scholars complete an interview exercise where they utilize the One Button Studio on campus to produce a video and then evaluate it. Offering a great cultural interchange between students, faculty and staff, the program enriches the university community. CASNR expects to host up to 200 Rwandan undergraduate students over the next eight years. Upon completion of the program, participants return to Rwanda and fulfill a five-year commitment to serve in critical areas across research, extension and training. With the support of key stakeholders and the university, these students are well positioned to advance agriculture in Rwanda. See also Faculty Mentor Rwandan Scholars on pages 24–26 of the Department of Agronomy and Horticulture annual newsletter. For more information about the Rwandan Scholars Program, contact Sylvana Airan at sairan1@unl.edu.